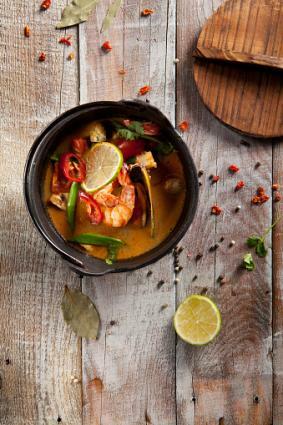 Tom Yum soup is a Thai soup typically made with shrimp. It has a distinctive yet delicious spicy and acidic (hot and sour) flavor. Serve the soup as an appetizer for a homemade Thai meal, or add some cooked rice to make it a full meal. Serve with lime wedges or slices as garnish, or top with chopped peanuts for a bit of crunch. While this recipe calls for galangal, it may be difficult to find in smaller markets. You can replace the galangal root with gingerroot to achieve a similar flavor. The recipe serves six. In a large pot, bring the stock, galangal, lemongrass, bay leaf, lime zest, and lemon thyme to a simmer. Strain out the solids and return the broth to the pot. Add the fish sauce, Thai chili paste, shrimp, mushrooms, green onions, and lime juice. Bring to a simmer and cook until the shrimp are just pink, three to five minutes. Stir in the lime juice and cilantro. Replace the shrimp with a pound of cubed chicken. The cooking time will be a bit longer; it will take five to 10 minutes to get the chicken fully cooked. If you can find them, replace the lime zest, bay leaf, and lemon thyme with six kafir lime leaves for a more authentic Thai flavor. If you can't find Thai chilies, try using red jalapeno chilies or serrano peppers. You can omit the peanuts or replace them with other chopped nuts such as cashews or almonds. Tom Yum soup makes a delicious meal or appetizer with classic hot and sour Thai flavors. If you use pre-made stock, the soup can be ready in less than 30 minutes.